TWO COMPANION PLANTS reflects on the idea of “Companion Planting” in gardening and agriculture, which promotes the planting of different crops in proximity to one another for a variety of reasons including pest control or crop productivity. TWO COMPANION PLANTS transfers this beneficial planting style into the electronic world, by putting two electronic plants in proximity to one another via a wireless network. A sensor-equipped electronic outdoor plant sends environmental data to its indoor companion, which comes to life only through network-transmitted data. 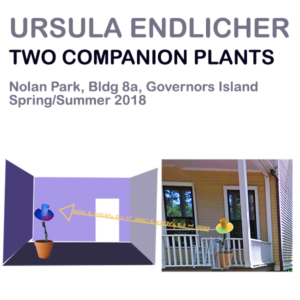 TWO COMPANION PLANTS – featuring an electronic outdoor plant which sends environmental data to its indoor companion plant – will be living on Governor’s Island over spring/summer 2018 as part of Harvestworks “Artworks and Experiences” exhibition. Plants communicate with one another in a networked way via their root structures connected by a mycorrhizal network, and in a “wireless” way via chemical signals perceived as scent by humans. “Companion Planting” in gardening and agriculture promotes the planting of different crops in proximity to one another for a variety of reasons including pest control and pollination or the increase in crop productivity. TWO COMPANION PLANTS playfully focuses on the communication between neigboring plants and transfers the beneficial planting style of companion planting into the electronic world, by putting two electronic plants in proximity to one another via a wireless network. Adding a “twist” to the concept, one of the plants is the master plant and is equipped with a set of sensors. As it sits outdoors on the porch of Building 8a, Nolan Park, on Governors Island, it can experience changes in the environment, while its indoor companion knows and can sense nothing about the outside world and is depending on the outdoor plant’s information. The outdoor plant houses a Rasperry Pi in the plant pot as its root, with a Pimoroni Enviro pHAT sensor pack installed on the plant stem (as part of the leaves) detecting light, air pressure, and movement, which change the mood of the plant shown inside the rubber-pedaled flower head on top of the pole, which has a small monitor inside displaying data-driven videos of the electronic plant’s character changes. If it is too hot or there is too little light the creature is unhappy… but it is very happy under the conditions that make “natural” plants thrive. The outdoor plants also “ripens” – it changes it’s color from green to a ripe orange over the course of the exhibition. Via WIFI the knowledgable outdoor plant sends the detected environmental data to the secondary plant indoors, which is set up with the same specs but without sensors. The indoor plants receives information about the outside world from it’s companion plant living on the porch, and comes to life only through network-transmitted data. Ursula Endlicher turns code into physical form. A media artist who has worked since the mid ‘90s with the Internet, she has translated the structural components, systems and interfaces of our Internetworked world into material formats. 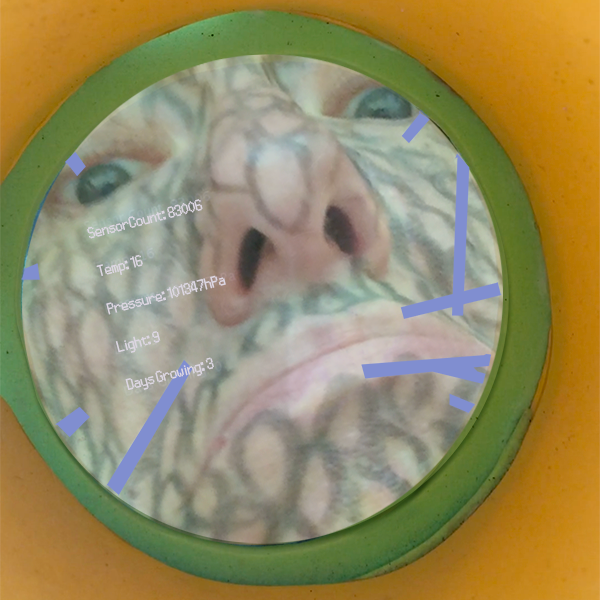 Combining her background in Fine Art, Theater Studies and Computer Art, she has built frameworks for Internet art, installations, objects and performances, with real-time data and code determining their layout and choreographies.